OMBUCHA™ KOMBUCHA IS A DELICIOUS, NATURALLY BUBBLY, FERMENTED PROBIOTIC VITALITY DRINK TO NOURISH YOUR BODY, MIND AND GUT. Ingredients: Distilled fluoride free water, organic raw cane sugar, leaf tea, kombucha culture. “Traditional tried-and-true Kombucha – straight-up, as-it-comes. Deep amber, apple cider notes delivering a tart, bubbly brew. OMBucha™ Kombucha is a delicious, naturally bubbly, fermented probiotic tea vitality drink to nourish your body, mind and gut. Every bottle is created and fermented with our own OMbucha™ Kombucha probiotic culture and only the highest quality, natural and unrefined ingredients. OMBucha™ is not pasteurised, contains no artificial colours or flavours, no preservatives, and is naturally raw, vegan, dairy free and gluten free. OMbucha™ is a raw living probiotic culture, rich in antioxidants and enzymes, good live bacteria and has antiseptic properties. Made with fluoride-free distilled water. Amber glass bottles to protect the living tea from UV light erosion. No industrialised processing, so no two batches ever taste exactly the same. Authentic craft & home-brewed with loving care, good vibes and infused with positive intentions. Like wine, stored as suggested on the label, your OMbucha™ will never spoil or expire*. Referred to as the ‘Elixir of Life’ and ‘Tea of Immortality’ as far back as 220BC, Kombucha is a refreshing, naturally fermented drink that is refreshingly tart, and containing very little sugar that sits somewhere between a flat apple scrumpy cider and champagne, without containing any significant alcohol†. OMBucha Kombucha is considered as Halal. Note: There are naturally occurring SCOBY (Symbiotic Colony Of Bacteria and Yeast) sediments throughout this drink. Often these settle on the bottom or start to form a new baby SCOBY. This is 100% safe and wholesome to drink, you can simply filter out the baby SCOBY. You can read about the signs of an authentic kombucha, and the benefits of the SCOBY forming in the bottle here – signs of authentic kombucha. If you shake the bottle, it will fizz up when opened, just like any carbonated drink. To stir up the contents, just give OMbucha™ a gentle swirl 2 – 3 times in a circular motion. 75% less sugar than fruit juice – Enjoy a bottle a day and feel the vitality! OMbucha™ can be kept either refrigerated or at cold room temperature for up to 2 years (consume within 10 days of opening), although watch out for the build up of naturally occurring carbonation if kept at room temperature! OMBucha can be enjoyed by everyone except pregnant women and infants. *Kombucha will continue to mature and will eventually become Kombucha vinegar which has a multitude of uses of its own: use it in salad dressings, skin moisturiser, as a hair tonic, or as a marinade. OMBucha Kombucha is a raw, living, and naturally carbonated beverage. Kombucha should always be refrigerated, and stored/served chilled. Opening at room temperature, or in warm temperature, can cause the carbonation to increase exponentially. A SCOBY is an essential ingredient used in Kombucha production which couldn’t take place without it. “SCOBY” stands for Symbiotic Culture Of Bacteria and Yeast. A SCOBY is a syntrophic mixed culture, where one species nourishes itself off the production of another. At OMBucha, we meticulous prepare our ‘booch with a carefully crafted SCOBY, and the end result is always the same: perfect Kombucha made with love, nourished to perfection and delectable, ready to serve for any social occasion! Learn more about what is a SCOBY or Kombucha Culture here. A yeast infection is never fun, but there is no need to fear kombucha if you have one or fear being at risk. Anybody suffering from vaginosis can benefit from the promotion of more positive bacteria in their body’s, and kombucha exerts its benefits in such a way that is ultimately healthy to the user. Read the full article on Kombucha and Yeast Infections here. Is OMBucha Kombucha safe for Diabetics? When it comes to serious conditions like diabetes, the obvious answer is always to consult your doctor before integrating kombucha into your diet. For those turning to alternative medical treatments, kombucha continues to be a sought-after – yet not scientifically proven – treatment modality, of which we’re excited to see research continue on. We have many customers whom are diabetic and use OMBucha Kombucha in their daily lifestyle for many health benefits – read the full article on why OMBucha Kombucha can be safe for diabetics. Ketogenic diets have increased tenfold in recent years due to their ability to help lower body fat levels and lose weight effectively. But is Kombucha compatible with the diet? Yes, Kombucha can be ketogenic-friendly, but it requires attentiveness and diligence to calorie counting to consume it while in ketosis! Read the full Ketogenic Diet and Kombucha article here. While Kombucha contains sugar – which is an essential part of the fermentation process – it’s found within minimal quantities in the end product which is negated by its overall health benefits and gut-promoting properties. As Paleo followers are quick to acknowledge, this has been sufficient to find its way into a modified version of the diet. As to whether it still constitutes a true “Paleo diet”, we’ll leave that down to the individual consumer to decide. We know we wouldn’t be so quick to discard it based on its abundance of health benefits! Read more for full details on why OMBucha is Paleo diet friendly. Is OMBucha Kombucha dairy free? OMBucha Kombucha is certainly free from dairy and no dairy products are used at any stage in the manufacturing process. We can confidently confirm that our kombucha is 100% dairy free. You can read more about our recipe and our production process here: Is OMBucha Kombucha dairy free? No animal products, animal derivatives, or animal processes are used in any of ingredients, bottle, or OMBucha packaging, so we can confidently declare that our OMBucha Kombucha is 100% vegan and vegetarian. You can learn much more about our recipe, our ingredients and our manufacturing process here: Is OMBucha Kombucha Vegan? What does Kombucha Tea taste like as a beverage? For our kombucha, we like to describe it as refreshingly sour, with a slight vinegary flavour yet being mild and not overpowering the palate. Many of our customers have likened its taste to a meticulously brewed mild craft beer, while others say it’s similar to a refreshing iced tea. What we can say, with a degree of clarity, is that we personally believe OMBucha Kombucha tastes at its best when consumed cold – refrigerated for at least a few hours so that when it hits your palate you’ll feel rejuvenated by the freshness this delightful beverage embodies. Read more about the taste and texture of kombucha tea as a very refreshing, enjoyable, beverage. Is OMBucha Kombucha Gluten Free? Yes, 100%, our SCOBY (symbiotic colony of bacteria and yeasts) is entirely gluten free, and all of our ingredients are gluten free. We have 100% confidence that not only is our authentic Kombucha tea gluten free, but it is also hugely beneficial for anyone who has eliminated gluten from their diet. The plethora of amazing probiotics in our OMBucha Kombucha are so good to repopulate, and manage, an optimal healthy gut bacteria microbiome. A happy, healthy gut (often termed the ‘second brain’) is absolutely essential for optimal health and functioning of body, mind and hormones. You can discover more about our ingredients and our manufacturing process here – all about the simplicity of our recipe! What strains of bacteria & yeasts are present in Kombucha? The yeasts and bacteria commonly identified as Acetobacter xylinum (bacteria) and Saccharomyces (yeast) have been considered the key players in Kombucha Mushroom Tea ferments. However, as research into kombucha continues and as recently as Feb 2007 specific strains of both bacteria and yeasts have been identified. Similarly to milk‐derived kefir, the exact microbial composition of kombucha cannot be given because it varies. It depends on the source of the inoculum for the tea fermentation. Chemical analysis of kombucha showed the presence of various organic acids, such as acetic, gluconic, glucuronic, citric, L‐lactic, malic, tartaric, malonic, oxalic, succinic, pyruvic, usnic; also sugars, such as sucrose, glucose, and fructose; the vitamins B1, B2, B6, B12, and C; 14 amino acids, biogenic amines, purines, pigments, lipids, proteins, some hydrolytic enzymes, ethanol, antibiotically active matter, carbon dioxide, phenol, as well as some tea polyphenols, minerals, anions, DSL, as well as insufficiently known products of yeast and bacterial metabolites. Like most things in life, a good thing just cannot be easily packaged or processed. It always ends up taking away some portion of the quality or essence of the food when creating something ‘safe’ and with a shelf life. Commercial Kombucha found in stores is limited by the bottling process. Companies need to suppress or halt yeast fermentation and culturing in order to prevent continued carbonation or the bottles could explode. This process leaves you with commercial kombucha which, while still good, typically has high acid and/or suppressed culture, and less varieties of bacteria and yeast. Read more here about what distinguishes our craft OMBucha from mainstream high-street kombucha. 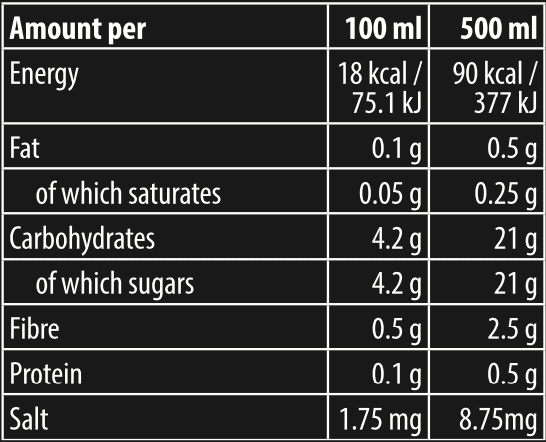 One question often asked is “How much caffeine is in OMBucha kombucha?”. Given that kombucha is made with black tea which contains a fair amount of caffeine, this is an important question if you generally avoid caffeinated beverages. There are a lot of different findings in this area that run the gamut from the caffeine is greatly reduced during the fermentation process to it isn’t reduced at all. One source, Dr. David Chappuis in his work The Green Tea Book, found that caffeine content of kombucha reduced by approximately 25% over a two-week brewing time. This could be extrapolated upon to assume that it would continue to decrease through longer brewing. With many different findings from many different sources, it seems safe to say that there is some caffeine in the final brew, though most sources consider it to be a relatively small amount. So, how much caffeine is actually in our handcrafted authentic OMBucha Kombucha – find out here: How much caffeine is in OMBucha? Read the full article here on why craft OMBucha is great for your gut and health. Kombucha promotes healthy digestion. Attributing to the process of fermentation with a live colony of bacteria and yeast, it works as a probiotic by helping in sustaining the gut health and provides relief from various abdominal disorders including chronic constipation and diarrhea symptoms. The digestive enzymes present in it enhance the effects of glucuronic acid and aid in the breakdown of proteins and saccharides thereby, making the digestive system more efficient. Kombucha possesses antibiotic properties i.e. bacteriocidal and bacteriostatic which works against a range of pathogens and is used for therapeutic purposes in human as well as veterinary treatments. Kombucha may have a remarkable ability to detoxify the body. It contains a powerful detoxifier glucuronic acid which binds the toxins by entering the liver and eliminates them out of the body via kidneys. Kombucha contains profuse amounts of organic acids like glucuronic acid and powerful antioxidants which may help in shielding the body from oxidative damage. The antioxidants present in it look out for the oxygen free radicals and neutralize their effects thereby, repairing and protecting the body from diseases and inflammations. Another suggested healing action purported by kombucha is its hepatic-protective effects. A research study conducted on kombucha has shown that its tea helps in restoring the levels of glutathione and is remarkably effectual in reducing the induced hepatotoxicity. A comparative study conducted on black tea, kombucha tea, and enzyme-processed black tea has proven the efficacy and superiority of kombucha tea in providing hepatic protection against the toxicity attributing to its antioxidant power as compared to the latter. Glucuronolactone, glucuronic acid is involved in the metabolism of detoxification in the liver whose glucuronyl rest of the body is linked to a group of foreign compounds or any of the metabolites in the body so that they become soluble in water and are excreted in the urine. Glucuronic acid should be distinguished from gluconic acid because it is linear and the gluconic acid is formed by oxidation of the different carbon glucose atom. Flavonoids are part of a large class of chemicals called polyphenols that occur naturally in plants. Flavonoids, which are found in a variety of fruits and vegetables as well as in tea and red wine, are thought to boost health in part by combating oxidation. That’s why they’re called antioxidants. Antioxidants help the body’s cells resist damage by free radicals. Tea has one of the highest total flavonoid contents of all plants at 15% of the leaf by dry weight and is the major source of flavonoids in the UK diet, providing approximately 80% of dietary flavonoids for the population as a whole. So don’t stop drinking your tea! Kombucha is made through a symbiotic relationship. The SCOBY itself is a symbiotic culture, as mentioned above, in which bacteria and yeasts co-exist in harmony. Because that SCOBY is a living entity, it needs food and a proper environment to thrive. A kombucha SCOBY’s food source is sweetened black tea. When you place a SCOBY into the prepared tea, it begins to consume the sugars and form another SCOBY, often referred to as a baby. The other symbiotic relationship, therefore, exists between the SCOBY and the sweet tea. The SCOBY needs the tea to survive and kombucha cannot be made without the SCOBY. This process can take as little as a week, if it is warmer, and up to a month in cooler temperatures. The by-products of this process are organic acids, a multiplication of the bacteria and yeasts within the sweetened tea, carbon dioxide (which is how kombucha becomes carbonated), a trace of alcohol, and B vitamins. Exactly what we need for a healthy balanced gut. Fermentation and fermenting tea is an ancient process, you can learn more about kombucha fermented tea and why ferment tea here. OMBucha™ Kombucha is our very own distinct, home-brewed kombucha recipe and style that we personally love! Kombucha is a fermented tea beverage, made by adding a symbiotic culture of bacteria and yeast (SCOBY) to a solution of tea and sugar. During the course of the week-long (or more) fermentation process, the cultures metabolize the sugar and tea components to render a naturally carbonated beverage, with a slightly sweet-tart flavour, full of healthy components like B vitamins, organic acids, antioxidants, and trace amounts of alcohol (see below). If the beverage is served “raw”, it will be teaming with healthy bacteria and yeast. During a second short fermentation, the brewer often adds flavourings like ginger, lemon, fruit juice or herbs to give the beverages unique taste profiles. As with any fermentation process, sugar is necessary to feed the yeast. Think about yoghurt, the yoghurt cultures consume the milk sugar (lactose) to produce a sweet-tart milk product teaming with probiotics. The process is similar for kombucha. The sugar feeds the yeast, which creates CO2 & ethanol, then the bacteria consume the ethanol and convert it into healthy acids. Very little sugar remains when it is bottled depending on how long the fermentation process lasts. Moreover, the fermentation process cleaves sucrose (polysaccharide) into fructose and glucose – both of which are utilized by the fermentation process thereby reducing the glycemic load. Over time the sugar diminishes as the tea conditions as the yeast continue to digest the sugar. In OMBucha the sugar will settle at around 4g/100ml when fully conditioned. With kombucha, sugar is a necessary evil but the good components vastly outweigh the relatively small amount of sugar in a glass and are doing you far more good than harm. No, it is not necessary, however, we do recommend that you do refrigerate your OMBucha™ Kombucha. OMbucha™ can be kept either refrigerated or at room temperature for up to 2 years (consume within 10 days of opening), although watch out for the build-up of naturally occurring carbonation if kept at room temperature! The majority of kombucha sold on the market, like OMBucha™ is raw, and therefore biologically active. The fermentation process continues as long as bacteria and yeast have sugars to feed on. Yeast is temperature sensitive, and cold temperatures keep them less active. Trace amounts of ethanol are naturally produced by the fermentation process. 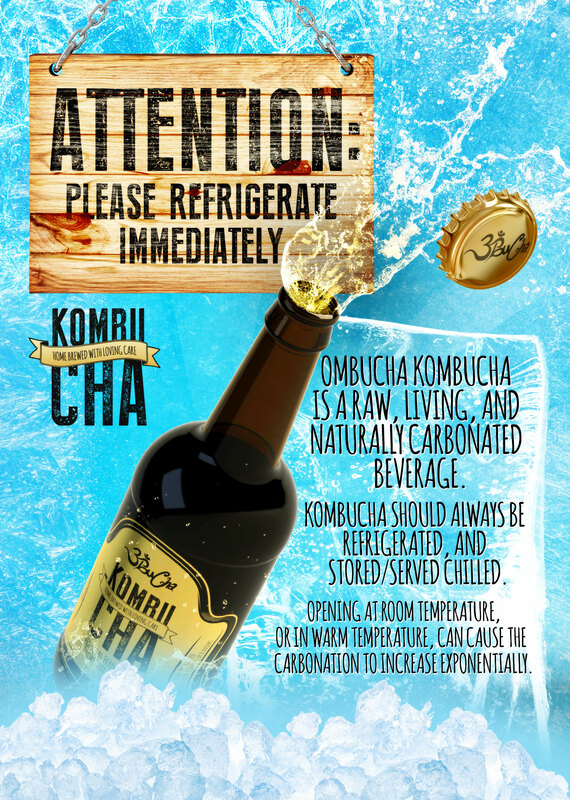 Keeping kombucha cold is an important means to ensure the quality remains consistent and compliant. If exposed to warm or hot temperatures, the fermentation continues rapidly and the carbon dioxide will build up quickly. The results could be anywhere from an excess carbonation upon opening to an exploding or broken bottle. It is important to keep commercial kombucha refrigerated at all times to prevent any mishaps. Good thing it is so delicious, leaving it in the bottle almost never happens! 12 – 20 days is the typical fermentation time for OMBucha kombucha however, numerous factors affect this from batch to batch, such as temperature, pH, taste tests and other factors… As a general rule, the longer the fermentation, the more tart the kombucha will be. Often the bigger the batch, the slightly longer the fermentation process can take. The time it takes to craft a quality brew is part of why kombucha is priced higher than other beverages. During the fermentation process and even after bottling, the bacteria continue to flourish and produces a by-product of the fermentation. This gel-like mass of cellulose, often resembling a jellyfish, is completely harmless and can be consumed or discarded. This is what the small SCOBY “floaters” or “jellyfish” are that are seen in Kombucha. A scoby pellicle forming in the bottle is a sign of an authentic kombucha though will depend on the age of the batch. The older the batch is the more conditioned and sharper it will taste; newer batches still taste quite tea-like and need a bit of ageing like wine to develop the full taste and flavour. Read more in-depth information about SCOBY pellicles forming in our true craft home-brew OMBucha kombucha. No, beer, ale, porter, stout, and other similar fermented beverages (including saké and similar products) of any name or description containing one-half of one percent or more of alcohol by volume, brewed or produced from malt, wholly or in part, or from any substitute for malt. OMBucha Kombucha is a naturally fermented tea. You can read about the alcohol content of OMBucha kombucha here. Every alcoholic has to make their own decision about what to consume. Many former alcoholics have stated they drink kombucha without issue. Others choose to abstain completely. Kombucha is a food and as such, each individual must decide for themselves if they wish to include it in their diet or not. We made a decision not to flavour with fruit, nor add extra sugars, to our kombucha recipe – purposefully developed to keep the alcohol level very low & in-keeping with the traditional original roots of kombucha making. You can learn more about the alcohol ethanol content of OMBucha here: Is Ombucha Kombucha safe for alcoholics to consume? Kombucha is not intoxicating. The trace amounts of alcohol are not present in sufficient quantity to induce a noticeable change in mood, physical or mental abilities as when drunk on alcohol. Some may experience a brief sense of euphoria created as the body’s response to uptaking nutrition. Some people who lack an enzyme called DAO and suffer from histamine intolerance may have an odd reaction to kombucha which can mimic drunkenness. You can read more about the details of inebriation from kombucha here – Is OMBucha Kombucha inebriating? Yes, OMBucha Kombucha is considered halal because it is non-inebriating and the ethanol serves as a preservative. OMBucha Kombucha contains trace amounts of alcohol, however, is not considered alcoholic. As with all fermented foods, a small amount of naturally occurring alcohol is typically present in kombucha. The alcohol is a by-product of the fermentation process. The yeast consumes the sugar and converts it to alcohol. The bacteria converts much of the alcohol to acetic and other organic acids. There are, however, types of kombucha with higher amounts of alcohol which are deemed alcoholic beverages for consumption by an adult 21+ consumer including hybrid drinks like kombucha beer.